WooHoo ... it's Friday! After a long 2 weeks of Travel, I'm thrilled to be home. 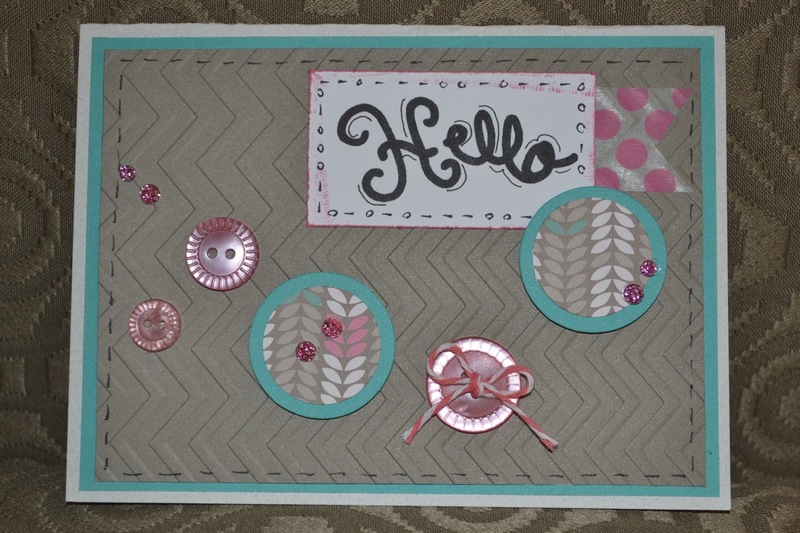 It's also our new Color My Heart Color Dare Challenge #87 so get out that new wonderful CTMH Ivy Lane paper and play along with us. 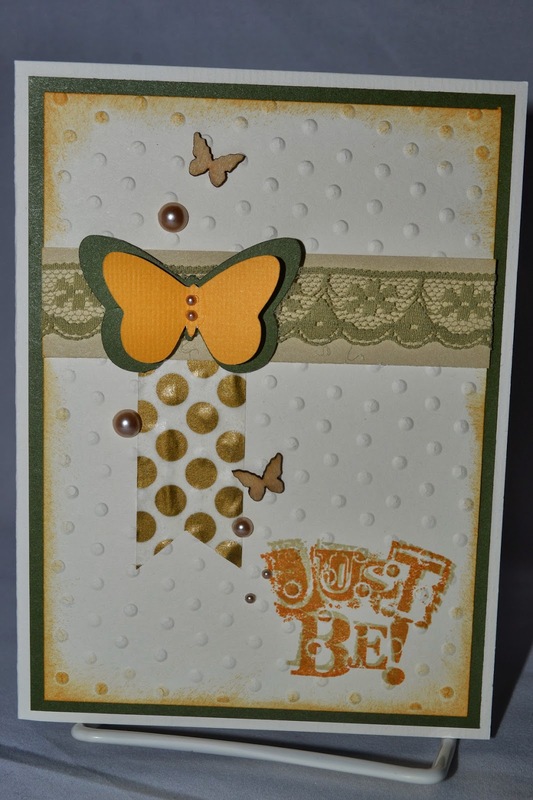 I decided I wanted to scrap with it as it has really cute stickease and embellishments. These photos are from my birthday this year. 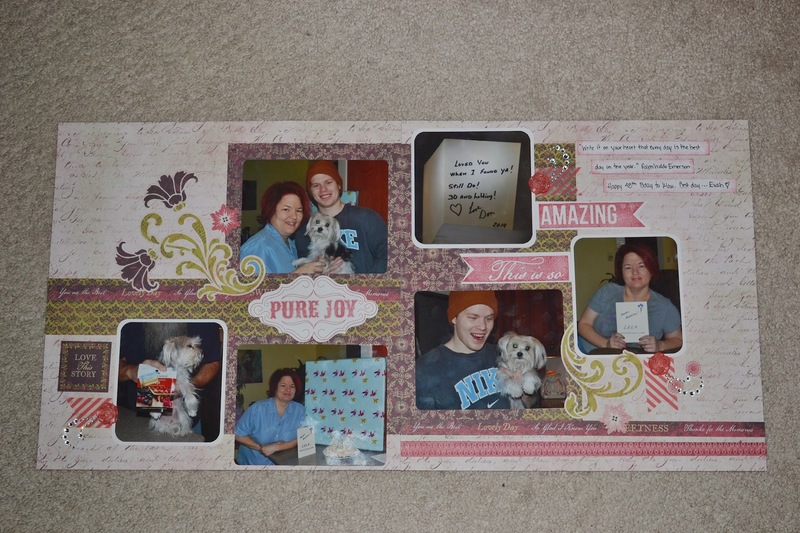 It was really nice to have my oldest son home for the party and my DH made me a card which I thought was SO SWEET! Happy Friday! Finally some Spring weather to enjoy, welcome back sunshine. We had a very tough winter this year and it feels great to see the sun and hear the birds. This Friday at our Color My Heart Color Dare #86, we're playing with Pondersosa Pine, New England Ivy and Goldrush. I didn't have any of the pine but the other 2 colors worked perfectly for this card. 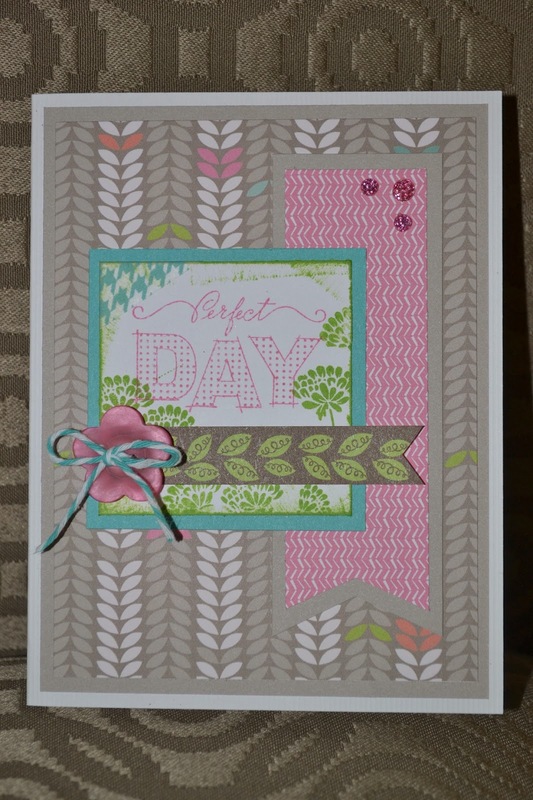 I hope you get time for some stampin' this weekend and you come over to the Color Dare and play along! Oh yeah ... watching basketball and scrappin' ... that's a fun Saturday! I've been wanting to get this page done because I didn't want to lose the memoriabilia, LOL! 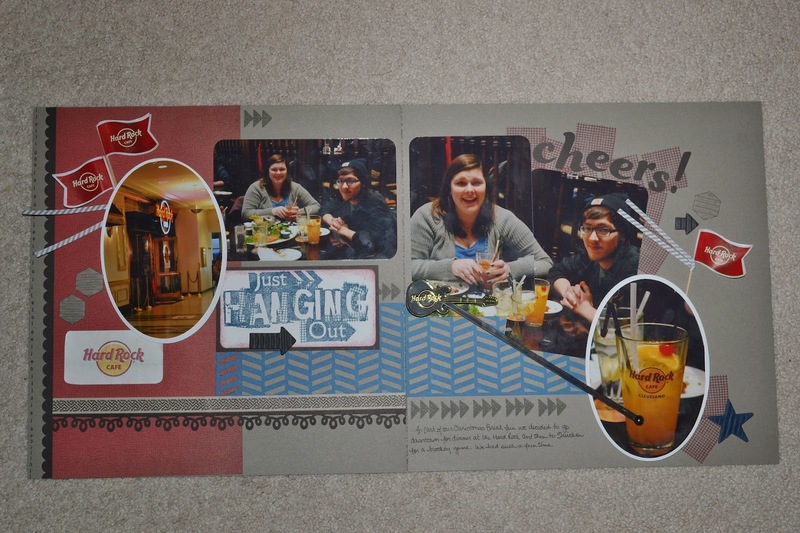 While my DS was home for Christmas Break, we went up to Tower City in Downtown Cleveland to the Hard Rock Café! Very good food and lots of fun. 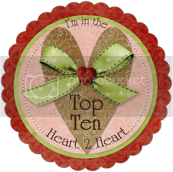 This is for March scrappin' Challenge at H2H to use one or more of the CTMH Cricut cartridges ... I used Artbooking tonight. TGIF! I love Fridays! Usually the end of a good work week and the start of a fun weekend. This week was CRAZY because of weather and a fun weekend is welcome! Off to the MAC Championship Basketball Game with friends to watch WMU play Akron. It's March Madness. It's also our Color Dare #85 with some super fun colors - Autumn Terracotta, Barn Red, Hollyhock and Olive. I used these for a summer/beach scene as I'm off to Florida here soon to visit my family and hope to get some relax time on the beach! I hope you're off for a fun weekend as well. Come and play! It's Sunday ... ahhh, a wonderful time to rest, relax, scrap and stamp. I did all of the above, LOL. 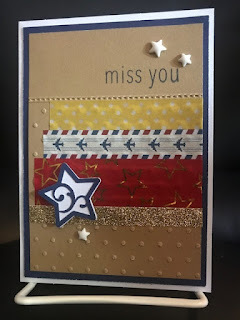 I made lots of cards for SCS Virtual Scrap Night (VSN) yesterday so I thought I would just scrap today but I wanted to be sure to get my MOJO Monday #335 uploaded because it's contest week and who doesn't like a prize?! 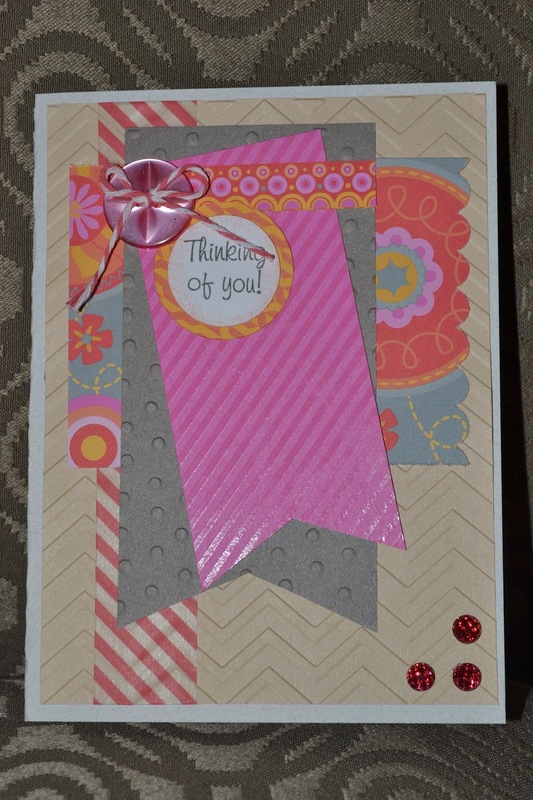 I actually CASED another gals cute MOJO Monday Card as I was inspired by hers. I loved the colors. I used the CTMH Lolly-Doodles again which has lots of fun colors. Today is Day 68 of our SCS 100x100 challenge. It's going well. TGIF Crafty Friends! I know I've posted here before about the Bird Feeder my DH put outside my Stamp/Scrap/Office Window for me. I really enjoy it as the birds come and go, especially in the Winter. Spring and Summer are fun too though because they are much more vocal and I can hear them as well as see them. 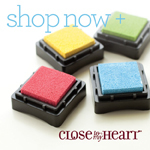 It's time for another Color My Heart Color Dare #84! This week we're playing with Topiary, Sweet Leaf and Sky. Come and play! The sketch I used was MOJO Monday #327 turned sideways. My College kids are on "Spring Break" ... wow! It's below zero so it sure doesn't feel like Spring, I feel for them. Wishing they would have better weather. I'm still in Illinois for work but headed home today. At least the snow and ice are done so it will be an easier trip home. Today is Day 63 of our SCS "100x100" Challenge. I used Retro Sketches #104 Card Sketch. I like all the layers. 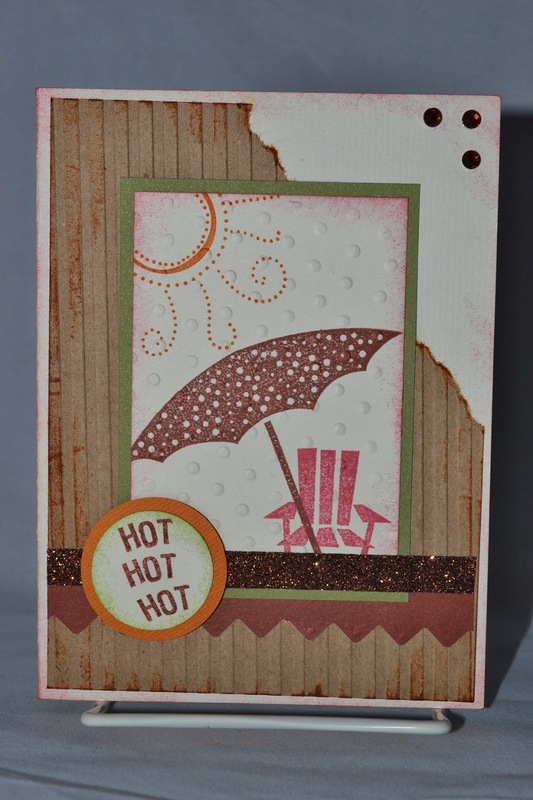 This is also for this week's H2H Challenge for "3", I used 3 DSP Prints & 3 Glitter Sparkles. Fun! 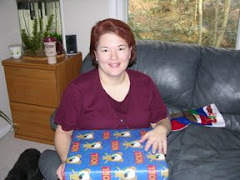 A new friend of mine over at SCS lost her DH to cancer. 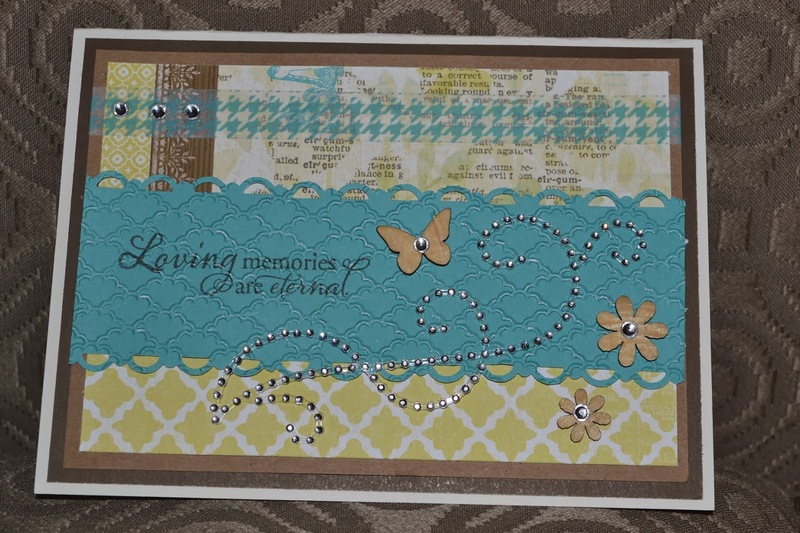 I have been wanting to get a card done for her but wasn't sure what papers and what I wanted for a sympathy card. It's a little more difficult. 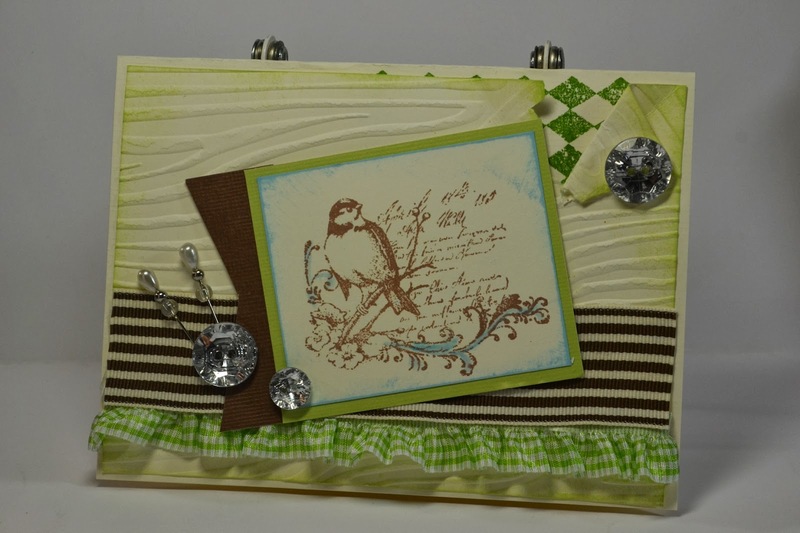 I decided to use the CTMH Skylark paper and I have some new stamps. It worked perfectly for what I wanted the card to say. It is day 62 of the SCS "100x100" Challenge. I was traveling so I had limited stuff but it worked and I also got the March Card Sketches at sb.com done. Oh yes, today was a truly "perfect day". Thanks to the snow and ice, it was a good day to stay in and stamp and scrap. I used this week's SCS Card Sketch 477. It's also Day 61 of our SCS "100x100" Challenge. As you can see, my bulk CTMH Lolly-Doodles paper is still out going strong. It's just so fun colors, it's hard not to use. I promise, I'll run out soon, LOL! 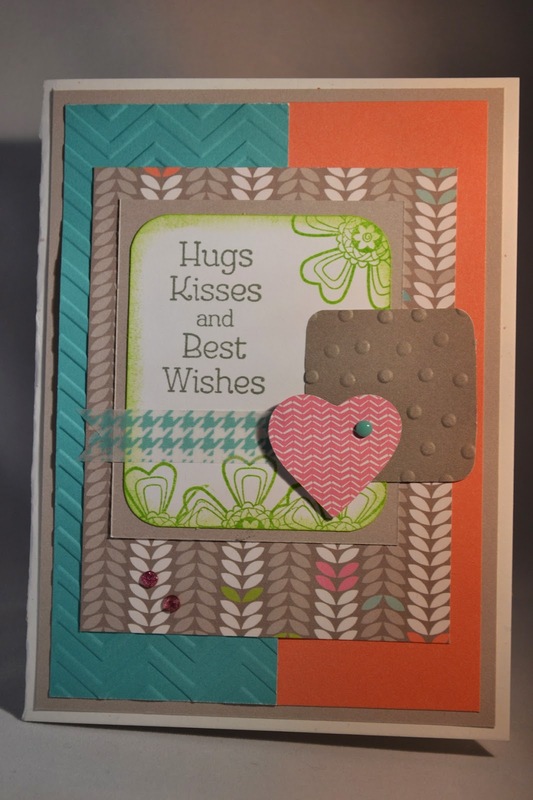 I hope you had lots of time for rest, relaxation and stamping too! So...I have business meeting Monday and because of the weather, I decided to travel to Illinois early to make sure I wouldn't have to drive through freezing rain and ice. Wow, am I glad I did. Ice is everywhere here. I packed a bag of fun stamping supplies and here I am, stamping away watching it snow. Woohoo! It's Day 60 of our SCS 100x100 Challenge. 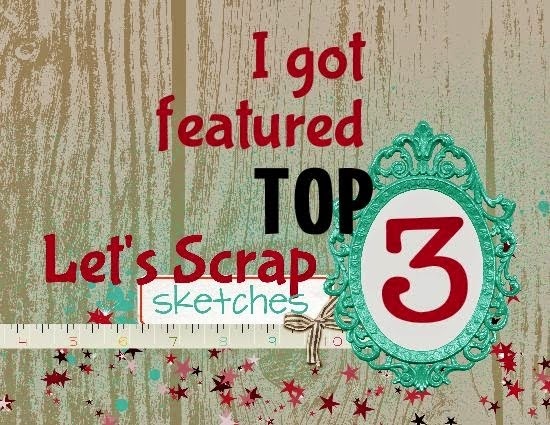 This fun sketch is Week 4 of the February Verve Challenge. In the LoveFest at SCS there was a doodle challenge so I decided to create my own sentiment. Stamp on!